Several weeks ago I shared my household supply closet stock list. If you missed it, it’s not too late to grab the free printable. After I published that post, I had a few people write to me asking about the specific items I stock so I decided to share a detailed breakdown of my everyday cleaning supplies along with a cleaning cheat sheet to make daily chores easier. And since I have one kid in college and three more behind him, I pinch my pennies wherever I can so I’ll be sharing some money saving tips with you as well. I know some people have laundry days, but with a large household of active kids and pets, if I don’t do laundry every day, it quickly overwhelms me. To remove yellow underarm stains – bring 1/4 cup salt, 1/4 baking soda, and 1 gallon of water to a boil in a large pot. Add stained items to the pot and boil for 1 hour. 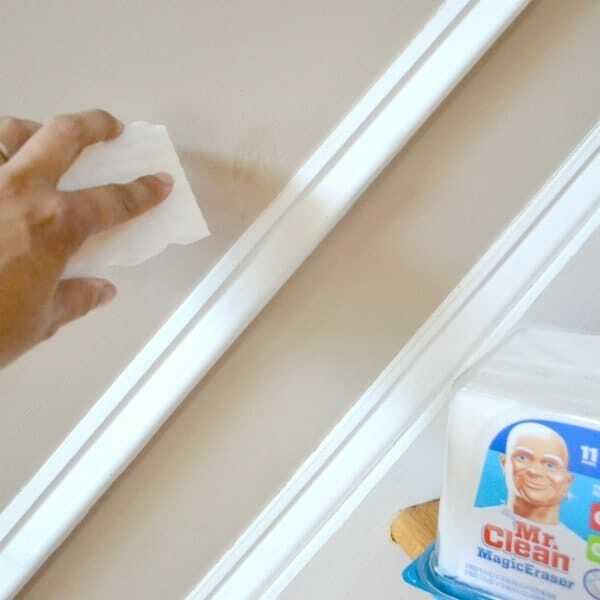 Used dryer sheets are great for cleaning baseboards! Their anti-static ability helps prevent dust from sticking to baseboards longer. Don’t forget to clean the outside dryer vent to not only improve drying efficiency, but to prevent fires too! Doing dishes is a never-ending chore. Since I attempt to feed my family three well-balanced meals each day, the kitchen sink sees a lot of action. Before you begin cooking, fill one side of the sink with hot, soapy water so you can clean as you go. Once a month, run the dishwasher empty with vinegar in lieu of detergent to clean away build up and eliminate odors. Establish a family habit of each person clearing his or her plate from the table, scraping scraps into the garbage and loading dishes directly into the dishwasher. I don’t clean my entire house every day, but every day I do try to do some cleaning. Daily tidying and cleaning keeps clutter and dust from collecting. Here’s one of many smudges that appear on my walls on a regular basis. One swipe with a Magic Eraser and the smudge is gone. Vacuum at least one room each day using attachments to remove dust from lamp shades, curtains, seat cushions, and baseboards. This will prevent dirt from building up and ruining floors and furniture and will cut down on your overall dusting and vacuuming time. Most of the dirt in a house comes in on our feet so make good use of floor mats at entrances and consider a no-shoe policy. 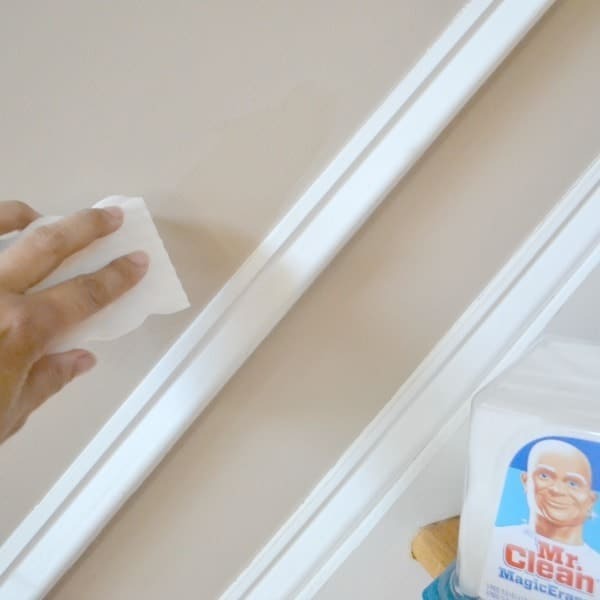 Clean top to bottom – Dust first and wipe in straight lines not circles. Vacuum last starting in the farthest part of the room from the door. Use a timer – If you know you only have 30 minutes to clean, you will do it more efficiently. Plus, if like me, you tend to get caught up in non-essential tasks like reorganizing the linen closet, a timer will keep you on task. Try to adopt a “one touch” or “one minute” rule – Rather than moving items from one pile to another, if it will take less than a minute, put them where they belong right away. Cash in on volume discounts by buying in bulk. For example, the Dawn Platinum Advanced Power dishwashing liquid I buy costs $2.80 for an 18-ounce bottle (14 cents per ounce) at my local grocery store. At Costco, I can get a 90-ounce container for $9.59 (less than 11 cents per ounce). Three cents doesn’t sound like much, but think about how often you do dishes and how much soap you go through in a year. Those small savings add up over time, especially when you’re saving a few cents here and there throughout your home. I keep the large containers in my supply closet and use them to refill smaller containers that I keep where I use the cleaning products (e.g. dish soap at the kitchen sink, Tide PODS in the laundry room). Another reason I do my bulk shopping at Costco is that they often run special offers on cleaning products that are automatically applied at checkout, in addition to the coupons they mail out periodically. On my recent trip, my receipt showed a $3.20 coupon discount on the Cascade Action Pacs I purchased (reg. price $15.99). I also clip coupons from my local paper (am I the only person in America who still gets the paper delivered?). 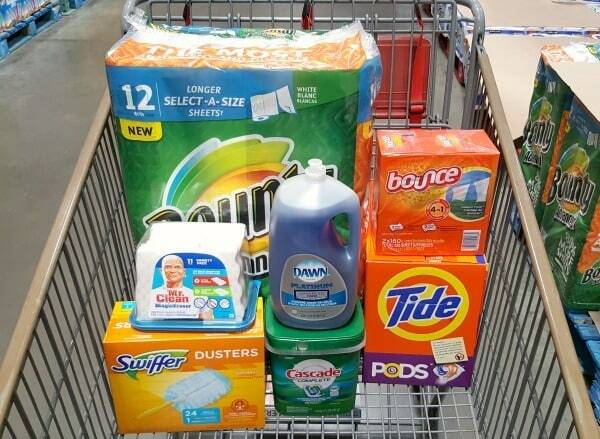 The P&G Saver always has tons of coupons for the cleaning supplies I use. Aside from not wanting to realize that I am out of dishwasher detergent until the dishwasher is full of dirty dishes, the main reason I keep a supply closet is so that I can buy products when they are cheapest, rather than being forced to pay full price because I need something NOW. Stock up while items are on sale so you have what you need when you need it without paying a premium for it. In my cleaning supply list you’ll see a lot of items that combine multiple functions into one product. Tide PODS might be more expensive than a liquid detergent, but they’re less expensive than detergent plus brightener plus stain fighter. In many cases, I opt for products that even though they might cost more than an alternative, they save me so much time that they are worth it. Your time IS valuable. 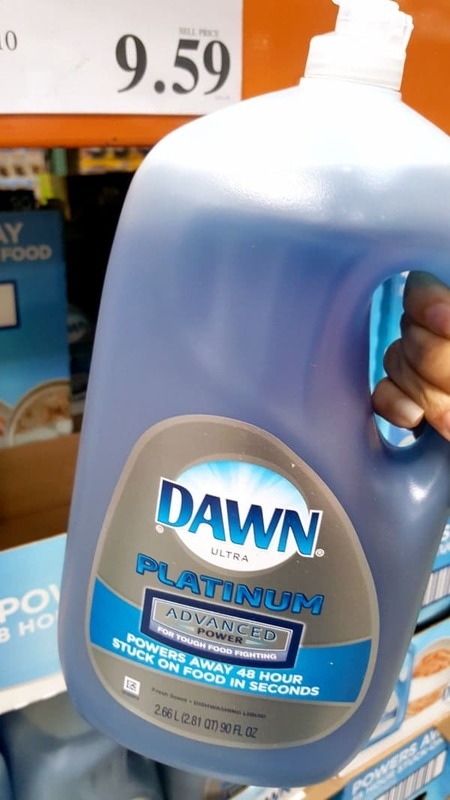 I’ll gladly pay a few cents more to use Dawn Platinum Advanced Power dish liquid instead of a store brand because over the course of a month, it saves me hours of scrubbing. I used to buy bargain dishwasher detergent because it was so much less expensive than brand name detergent and I didn’t think there could be that big of a difference between products. I was wrong. I usually ended up either running the dishwasher twice to get the dishes clean, or I had to basically hand wash dishes before loading them into the dishwasher meaning I also lost lots of my valuable time, plus ran more water and used more electricity in addition to using twice as much dish detergent. 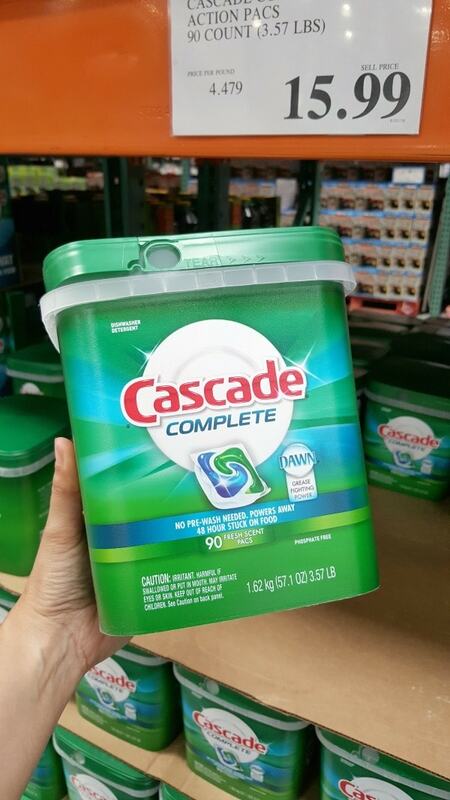 Now I use Cascade Complete Action Pacs and I don’t have to pre-wash to make sure my dishes come out clean. Before I switched, if I had run the dishwasher with the dishes looking like this, I would have been scraping those food specks off after the cycle ran and then run the load a second time. You can’t tell from the picture, but those bowls are even filthier on the inside (it was pasta night). 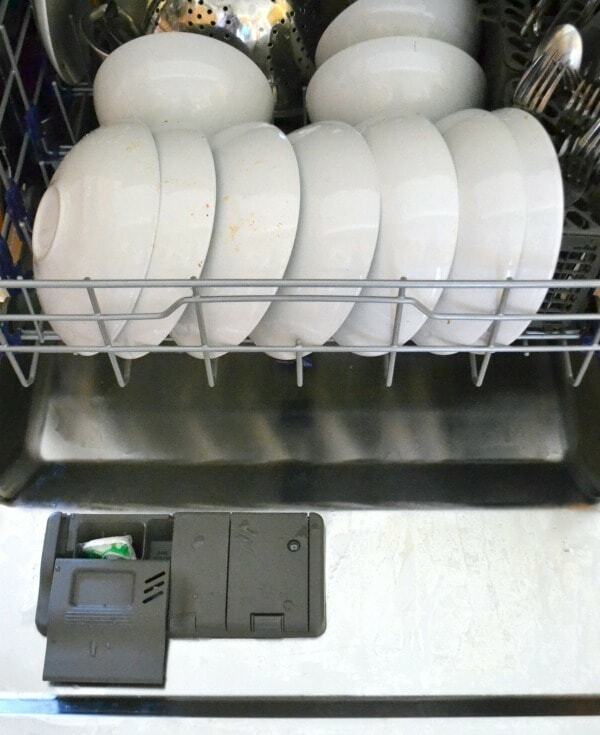 It seems counter intuitive to clean more often to use fewer cleaning supplies, but it works. Think about carpet spills. It’s so much easier to clean a spot on the carpet if you catch it when it happens, before it can soak deep down into the carpet fibers, collect dirt, and dry into a permanent stain. If you’ve ever tackled a set-in stain, you know how much product, elbow grease, and persistence it takes to try and eliminate it. Washing dishes before food dries onto them is much faster and requires much less dish soap. If you establish good cleaning habits, you’ll save yourself many hours and you’ll use fewer products over time. 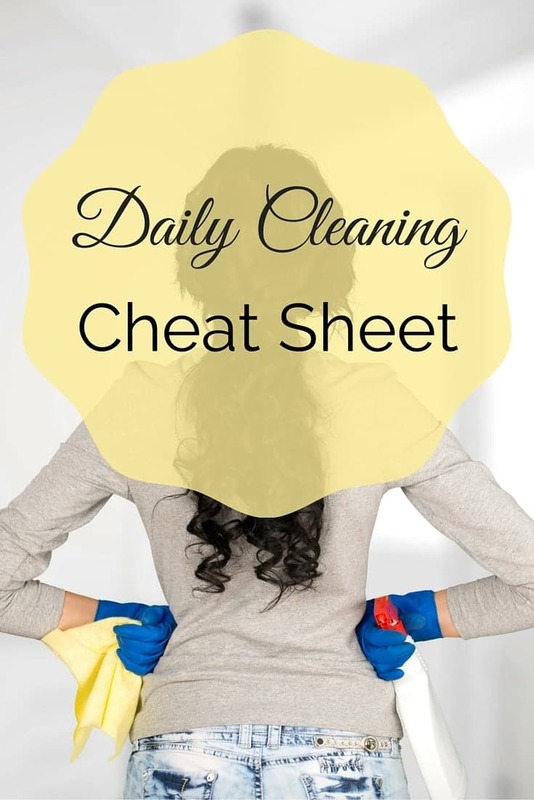 To help you stay on track, I’ve created a Daily Cleaning Cheat Sheet with several of the tips I’ve shared in this post. 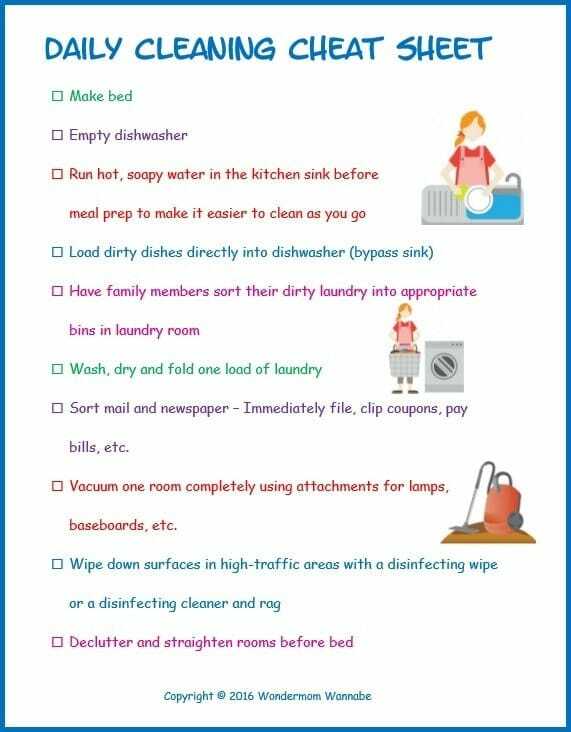 You can laminate it (or keep it in a page protector) so you can check off items during the day and wipe clean the next morning to use the sheet again rather than waste paper printing a new sheet off each day. After a few weeks, you’ll find that most of the tasks have become habit and you’ll no longer need a cheat sheet.